Earlier this week, we welcomed Sonia Reiter, our TestingMom parent expert, to share her experience with both applying for and testing in the LAUSD Gate Program. Today Sonia continues her story by discussing qualifying for the LAUSD GATE Program. Exceptional children who may qualify for the Highly Gifted Magnet program may be referred by their teacher, parent, and gifted coordinator for testing with the school psychologist as early as the second semester of kindergarten (and in later grades as well). Of late, they have been administering the NNAT. It is a small group test consisting of 48 questions. The question types are all nonverbal logic and reasoning puzzles; there are no directions to read and no oral directions given. Referral for this test is usually done by the teacher, but can also be done if the parent asks for it. When the parent asks for it, testing is not guaranteed. The teacher screens the child to see if there is evidence to support the referral, then submits the file to the gifted coordinator for review. If there isn’t, the child will not be tested and the teacher should meet with the parent to gently explain why. If the child is tested and scores 95% and above (or 90% and above if receiving free or reduced lunch), he is officially designated gifted. Only if he scores 99.9% is he identified highly gifted. The test given by the school psychologist is the only test that determines highly giftedness. Please note that while the NNAT has been mentioned as the test most-given as of late, test choice is solely at the discretion of the psychologist administering it. In the past, we have also heard of IQ tests such as the WPPSI, WISC and Stanford-Binet being given. Now don’t fret if your little genius isn’t tested early! Every single second grader in LAUSD is also tested using the OLSAT (The Otis-Lennon School Ability Test). This means that every single child enrolled in the second grade within LAUSD has at least one chance of being identified as gifted. The OLSAT is a test given in the classroom by the teacher. There are two parts to this 60-question test. Thirty questions are verbal, meaning the teacher reads the directions out loud to the class ONE TIME, and the other 30 questions are non-verbal, like brain-teaser puzzles. A passing score on the OLSAT is EITHER 95% and above on the verbal portion only, the non-verbal portion only, OR the total score (or 90% and above on ONLY the total score if receiving free or reduced lunch, NOT 90% and above on either the verbal or non-verbal portion). Passing the OLSAT is sometimes considered documentation supporting the referral for testing with the school psychologist if the child hasn’t already done so. The purpose of taking the test given by the school psychologist at this point would be to see if your child qualifies as highly gifted and can be in the Highly Gifted Magnet program. On Monday, we’ll talk about the difference between SAS and GATE designations. Join us as Sonia outlines the testing and admissions process in this 5-part guest blog post. 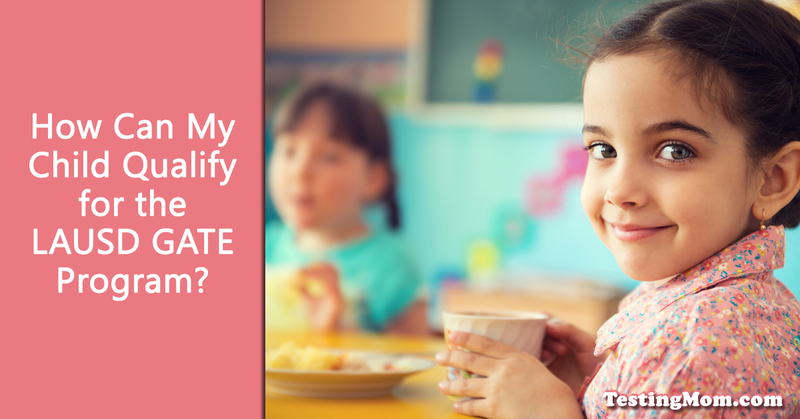 How Can My Child Apply for the LAUSD GATE Program? What’s the Difference Between SAS and GATE Designations? Sonia Reiter is a parent-expert on LAUSD GATE and SAS programs. She guides parents who, like her, seek the best education programs LAUSD has to offer. For more information, contact Sonia at sonia.reiter@yahoo.com.